In late 2013, E-Volo flew a driverless version of the Volocopter, and Stephan Wolf, one of the company's founders, is confident that the first piloted model will fly very soon. While it won't be cheap, it is the kind of technology that will eventually democratise flight by the mid-2020s, says Bülthoff. Developed by pilot Mike Jump and his colleague Mark White at the University of Liverpool, the simulator that I flew simplifies flight control down to basic up, down, left, right and speed control moves that anyone can learn in a short time. Or it can fly autonomously between chosen points. In tests, five volunteers who had never flown but who could drive cars, mastered the system in around 5 hours. 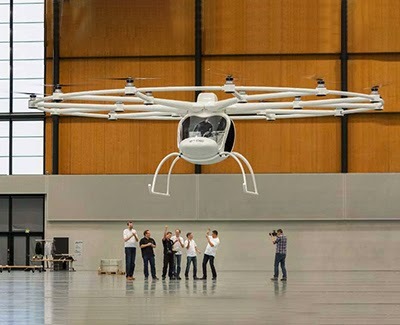 The Volocopter has 18 rotors, each 1.8 metres long, that work in counter-rotating pairs around a circular frame. While it looks odd, this arrangement means the torque effects of each pair cancel out and the vehicle just goes up and down, or side to side, by changing the speed of different rotor pairs.The prototype has nine lithium-ion battery packs, each driving two motors, that currently allow it to fly for 20 minutes. The joystick works in the same way as a quadcopter remote control, Wolf says. "It's easy to fly even if you have never flown. If you let go of the stick, the Volocopter just hovers where you left it," he says.